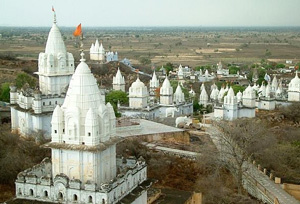 Sonagiri Temple is one of the primary pilgrimage places for the Jain Followers. The word “Sonagiri” means “The Golden Peak.” This pilgrimage site is considered as sacred to Digambar Jains. This temple is unique as this was the site where Nanganag Kumar attained Moksha along with his fifteen million followers. Sonagiri has a lot of Jain Temples scattered in the area. Ascetic saints and devotees visit this temple to practice austerity and self-discipline. 77 Jain temples are located in the hilly area while twenty-six are located in the village. The temple can be seen from a distance because of its tall spire. The temple houses an 11 feet tall, the attractive idol of Lord Chandraprabhu. Idols of Lord Parsvnath and Lord Sheetalnath can also be seen in the temple. The temple is not only known for its spiritual significance but also for its architectural glory. Pilgrims and tourists visiting the temple are left awestruck to see the 43 feet tall Manstambh, also referred to as the column of dignity. Many renowned and learned Saints are known to gain salvation at this site. Salvation has always been the highest aim of the Jain saints and pilgrims and this temple offers the peace and tranquillity necessary to practice meditation. Shatrunjay, the magnificent mountain of the area is dotted with no less than 900 temples. Each supersedes other in magnificence and architectural splendor. Pilgrims have to ascend 3500 steps or 3 ½ km to reach the summit. Beautiful images and idols, intricate carvings, impressive murals and jeweled statues are the unique attractions of these temples. Many state roadways and private buses and taxis ply their services to reach this temple. Gwalior is the nearest airport to reach this temple. When traveling through a train, visitors can disembark at the Palitana Station. During the annual fair that commences from Falgun Shukla 14 and culminates on Chaitra Krishna 5, the temple witnesses a large number of visitors.